The Otterhound is a large and strong dog with rough double coat and webbed feet. They generally weigh between 80 and 120 pounds, and they are known to be tenacious once they pick up a scent. These dogs are friendly and even-tempered, and the Otterhound is devoted to the family. They might still not be the best choice for families with children because of the size; their hunting instinct is extremely strong, and they're stubborn when it comes to following an interesting smell. They need more supervision outdoors than most breeds, and a child might not be a good choice for dog walker. 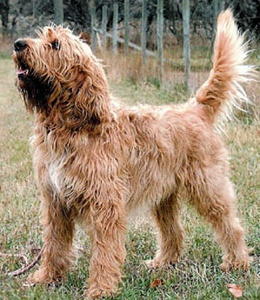 There are around 1000 Otterhounds in the world and only around 350 in North America. Wow, they are rare! A very cool looking dog though and sounds like they're pretty hard workers. I'd love to meet one! They are cool dogs. I think most hounds are strong minded and can be tough for kids to handle. I think you're right. =) Strong and strong willed, LOL! Greatest dogs in the world, got my first in 1997, and have two now, one is an AKC Grand Champion, the other just starting to show. They love people, especially children. Yes, they are big, but graceful, intelligent, inquisitive, family oriented, and sensitive to your moods. If you've never seen one in person, look for them especially at dog shows. Check out The Otterhound Club of America website for lots of pictures and more information, you wont regret it!